I do not yet own one of these readers, but I am sure will get one not too long from now. I like having a book in my hand, but that's because I'm used to it. It's just a matter of time and a matter of getting adjusted to something new. It's clearly the wave of the future and there is no use fighting it. I got a Kindle DX for my birthday last year and absolutely LOVE it!! Being a reader who has at least 5 or 6 books going at any given time, it's been more than convenient to take it with me everywhere. Publishers need to go back to the drawing board and change their business models. They really can make much more money from people like me, who also frequents the library. I used to renew books until I worked my way through the pile of books I check out. Now, if I like a book into the first few chapters, I buy it in a matter of seconds for a much lower price. I can see where this will kill the used bookstores though. Sure there are a few things about the device I'd like to see, like the background lighting and a better filing system, but the perks of reading on the device have more than made up for it, and I can wait for the industry to improve ereaders. I just got myself the Barnes and nobel nook and I had the first kindle. I actually love having an ereader because it's like a bookstore in my hands.I like the fact that I can download a book in seconds which means I will read and buy more.I also love seeing the cover art and I think the nook addresses this. I agree it's the wave of the future and the same thing music companies are facing. They all need to re adjust to a digital age. The readers as with all new technology have bugs to work out but I think the future looks great. I have a Sony Reader - it's blue. I love the idea of carrying hundreds of books around in the palm of my hand. I wish I'd had the e-book reader a few years ago when I lived/studied abroad in England. When I came home I threw away a lot of clothes and shoes so I could dedicate an entire suitcase to all of the books I'd accumulated! But, as much as I like the idea of the Reader, I rarely ever use it. I downloaded 100+ free classics when I first got it and then donated my print versions of the classics to the library sale. I love books for more than just their literary value and stories inside. I love the covers, I love the way they feel and smell. Books decorate my apartment. I'm a pretty tech savvy girl, but I don't think I could 100% convert to an e-book reader. At least not in this decade. I owe my recent success to the Kindle. Pricing my books at 99 cents for the Kindle allowed readers who wouldn't have given me the time of day otherwise to take a chance. Fortunately, they liked what they read, posted reviews, and word-of-mouth spread from there. Faking It peaked at #6 on the Kindle Store Bestseller list two weeks ago, and is holding steady in the Top 20. Ordinary World is #10 in Contemporary Romance and in the Top 100 overall. I've written about the quandry of this -- I love tactile books and independent bookstores (especially since they've been so supportive of me). I've been told that I'm contributing to the price wars and the devaluing of books by pricing my own books so low. But it got me what I really wanted: a readership. The industry is in the midst of a paradigm shift, and I hope they can pull through it because e-readers will be as common in iPods by the end of the year, I predict. 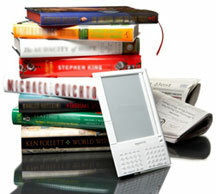 I see no reason why print books and e-books can't happily co-exist! I got one of the first Kindles made. I like being able to increase font size. I can read faster, and thus, more books this way and it is easier on my eyes. If a book I want is not available on Kindle, I request it and wait until it becomes available. I love my Kindle.